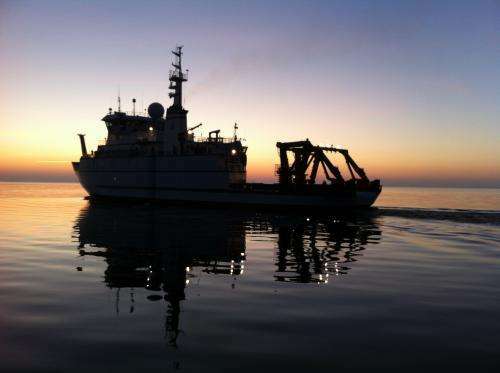 The National Science Foundation's (NSF) research vessel (R/V) Sikuliaq will spend its first winter on the Great Lakes before making the long journey to its home port in Seward, Alaska. Sikuliaq, pronounced "see-KOO-lee-ack," is slated to arrive in Alaska during spring 2015. Sikuliaq is owned by NSF and will be operated by the University of Alaska Fairbanks. It had been scheduled to leave the shipyard in Marinette, Wis., prior to the Saint Lawrence Seaway's winter closure, but construction delays have prevented that. However, just because Sikuliaq is confined to the Great Lakes for the winter does not mean it will hibernate. "A late delivery for a ship is never good. That said, the best part of this news really is that the crew will be able to test the ship's ice-cutting capabilities close to the shipbuilder, and even more exciting, it offers a fantastic, cost-effective platform for researchers at Woods Hole Oceanographic Institution to test a new hybrid underwater vehicle right there in the Great Lakes," said Matt Hawkins, NSF program officer. "This is just great for science. It's like a perfect storm of opportunities where everyone wins," said Andy Bowen, Woods Hole engineer who has led the institution's efforts with underwater robotic vehicles and is director of its National Deep Submergence Facility. He and a team of Woods Hole engineers will use the Sikuliaq for several days in March to test the Nereid UI, a modification of their deep-water hybrid underwater vehicle Nereus, for future use in polar and other icy environments. Nereus cut its teeth in the deepest part of the world's oceans at 11,000 meters deep at the Mariana Trench and has been modified to work in a polar environment. Both of these tools are hybrid versions of autonomous underwater vehicles, allowing for extraordinarily long, very strong tethers, specially outfitted for deep-sea conditions. "Oftentimes, we get funding to build a tool, but not to test and prepare it at sea," Bowen said. "Here we have a transformative tool being tested on a transformative platform. We have the rare opportunity to walk before we run in this Great Lakes environment." Ultimately, Nereid UI ("UI" for Under Ice) will help polar researchers by providing high-quality underwater imagery, particularly from under the ice, while also collecting biological specimens and information and measurements on salinity, density, ice/water interaction and water chemistry. In addition to testing the hybrid underwater vehicle's technology, Bowen and his colleagues will also help test Sikuliaq's connectivity as well, reaching out via some of the latest satellite technology in virtual conferencing to the general public or potential scientists who might want to eventually use the tool. The hybrid underwater vehicle itself was funded by NSF's Division of Polar Programs while Sikuliaq was funded through the Division of Ocean Sciences. "This is a great example of NSF divisions coordinating activities to the benefit of both science and the taxpayer," Hawkins noted. Work to prepare the ship and crew for science operations will continue through the winter months. "It is truly inspirational to see Sikuliaq under her own power on trials in Lake Michigan," said Michael Castellini, dean of the University of Alaska Fairbanks School of Fisheries and Ocean Sciences, "To have the ship this close to science operations after three decades of work is a wonderful time for the university, Alaska and marine science." Upon exiting the Saint Lawrence Seaway in late April, Sikuliaq is scheduled to participate in ice trials near Greenland and ultimately make its way to Washington, D.C. and Norfolk, Va., for a port visit and dry dock inspection before transit to the Pacific Ocean. Science operations are expected to begin in fall 2014. Sikuliaq's first funded science projects will not occur amongst sea ice and polar caps, but rather in the equatorial Pacific and along the west coast before making her way to her homeport in Seward, Alaska, where she is expected to arrive in early 2015. Seattle-based Glosten Associates designed Sikuliaq and it is being built by Marinette Marine Corporation in Marinette, Wis. Sikuliaq is uniquely equipped for operating in ice-choked waters. Its reinforced double hull, two rotating thrusters and scalloped propeller blades will enable it to break through ice up to 3 feet thick. The ship also will be outfitted with the latest technology for oceanographic research, including advanced navigation systems, acoustic mapping systems and sensors, and deck systems for deploying a wide array of science equipment into and out of the water. Sikuliaq will primarily support oceanographic research in polar and sub-polar regions of the world.